Anyone who's followed the exploits of the Dime Brothers know we are fond the Hint of Lime chips offered up by our good friends, Tostitos. These chips are decently crunchy, and hold together well after the first bite. Not too crumbly. The Frontera website says they're all natural with no preservatives. That sounds friendly and healthy. "They're made the old-fashioned way from authentic stone-ground yellow [organically grown] corn." Wow! So I might be eating a healthy snack, eh? One problem. The packaging is misleading. It says they're lime and sea salt tortilla chips. That's accurate except for the lime and sea salt part. I could only rarely taste salt, and am still not sure if I ever picked out the lime taste. The ingredients more clearly state that the chips are cooked in water with a trace of lime, and that they also contain lime juice. Tostitos does a much better job with the lime and salt taste and they only claim to have a hint of lime! 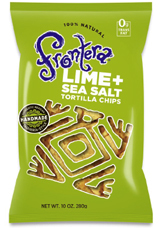 So if you're out there thinking you can substitute Frontera Lime + Seat Salt Tortilla Chips for Tostitos Hint of Lime, think again. And if just one person is saved from the torture of eating Frontera's version, this article will have been worth it.